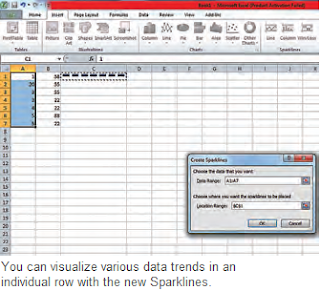 One of the great features of Excel 2010 is the inclusion of Sparklines that allow you to visualize the data of the selected cells in the form of charts. It makes it easier to analyse the data and spot trends. Sparklines is the newest, most interesting feature of Excel 2010. It allows you to simultaneously visualize your data in the form of bar, profit or loss displays in the same sheet. It also includes various other options that further increase its efficiency. Mark the desired series of data and go to the ‘Insert’ tab here you will find the Sparklines option next to the Charts. Here select the display option from Row, Column or Profit/Loss. Once you select an option you will see a box ‘Create Sparklines’, you will fi nd your selected data range now feed the location range i.e. the area where you want the display the Sparklines. Confi rm with ‘OK’ and the Sparklines will be displayed in the desired area. This will also activate the ‘Sparklines Tools under the Design Tab, which allows you to make changes to the Sparklines. You can display the Sparklines according lowest or highest points, negative points, fi rst or last points etc. You can also change the colour for each Sparkline or even individual Markers. If you wish to delete the Sparklines you can do so as well. You also have the option to Group the Sparklines together and then from here you can either remove an individual Sparkline or remove the entire group.